From time to time I like to CASE a card and create many variations of it. I also like to find a card template to follow. 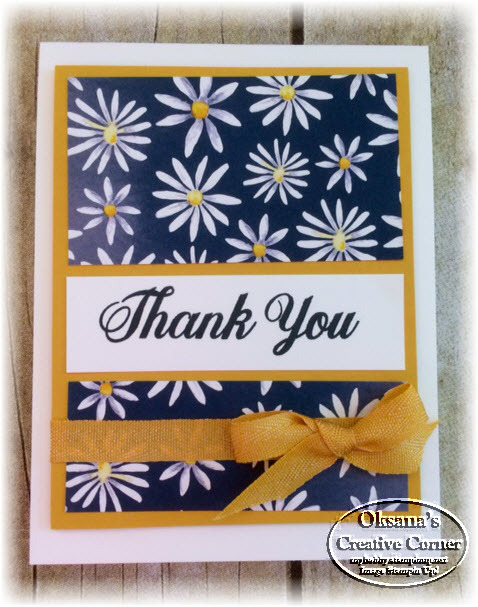 This one can be used in so many different ways, many occasions, with just stamping or designer paper. The idea is to use blocks of paper as a focal point on you card with the greeting as a middle block. Check those 2 cards - they are using absolutely same template. Color Blocks - they are all 3 1/2 wide. Top piece 2 x 3 1/2, middle - 1 x 3 1/2 (for greetings), bottom - 1 1/4 x 3 1/2. Stamp greetings in the middle. If you use designer paper for 2 other blocks - just adhere your blocks to the colored mat, wrap a ribbon and add to card front with dimensinals. If you are stamping - put all pieces on top of each other (top, sentiment, bottom) and stamp over desired images. Adhere to the colored mat in the same order you had it. Add ribbon and adhere to card front. Use your Designer paper for quick set of cards.